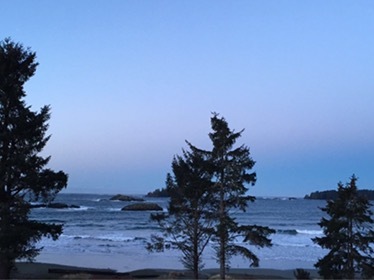 In Tofino for this week, today preparing for 60 people who will be joining us for an Art of Hosting. The beach here, as anyone living on the exposed west coast will know, is constantly buffeted by surf and there is an endless white noise created by the waves crashing on the four sets of reefs offshore. Once, when I was in Quinault in Washington State, I remarked to an Elder that this sound must have had a beginning at some time in the earth’s history and perhaps will have an end. But in the meantime, as long as human ears have lived on this coast, the sound of surf has always filled them. As we begin a week of teaching some of the arts of community, I am reminded of the aspects of our better nature that we humans have always had, and my focus is fixed on what ways of being community, like the sound of this surf, have accompanied human beings forever. What reply had the elder? The crashing waves creates one of the most soothing, rhythmic sounds I’ve ever encountered. I am drawn to it and will travel down the coast during winter for a fix. I wish I was there with you this week, topping up my hosting and community skills with you. Good luck this week Chris, Caitlin, Kelly, team!